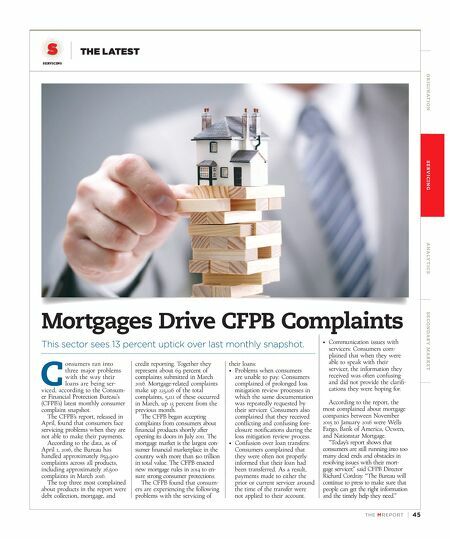 TH E M R EP O RT | 45 O R I G I NAT I O N S E R V I C I N G A NA LY T I C S S E C O N DA R Y M A R K E T SERVICING THE LATEST Mortgages Drive CFPB Complaints This sector sees 13 percent uptick over last monthly snapshot. C onsumers ran into three major problems with the way their loans are being ser - viced, according to the Consum- er Financial Protection Bureau's (CFPB's) latest monthly consumer complaint snapshot. The CFPB's report, released in April, found that consumers face servicing problems when they are not able to make their payments. According to the data, as of April 1, 2016, the Bureau has handled approximately 859,900 complaints across all products, including approximately 26,500 complaints in March 2016. The top three most complained about products in the report were debt collection, mortgage, and credit reporting. Together they represent about 69 percent of complaints submitted in March 2016. Mortgage-related complaints make up 223,126 of the total complaints, 5,111 of these occurred in March, up 13 percent from the previous month. The CFPB began accepting complaints from consumers about financial products shortly after opening its doors in July 2011. The mortgage market is the largest con - sumer financial marketplace in the country with more than $10 trillion in total value. 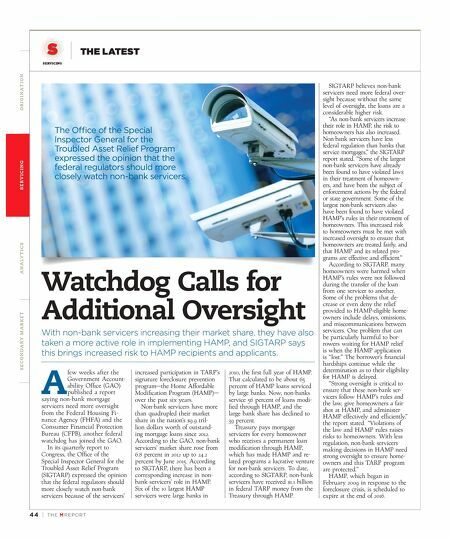 The CFPB enacted new mortgage rules in 2014 to en- sure strong consumer protections. The CFPB found that consum- ers are experiencing the following problems with the servicing of their loans: • Problems when consumers are unable to pay: Consumers complained of prolonged loss mitigation review processes in which the same documentation was repeatedly requested by their servicer. Consumers also complained that they received conflicting and confusing fore- closure notifications during the loss mitigation review process. • Confusion over loan transfers: Consumers complained that they were often not properly informed that their loan had been transferred. As a result, payments made to either the prior or current servicer around the time of the transfer were not applied to their account. • Communication issues with servicers: Consumers com- plained that when they were able to speak with their servicer, the information they received was often confusing and did not provide the clarifi- cations they were hoping for. According to the report, the most complained about mortgage companies between November 2015 to January 2016 were Wells Fargo, Bank of America, Ocwen, and Nationstar Mortgage. "Today's report shows that consumers are still running into too many dead ends and obstacles in resolving issues with their mort- gage servicer," said CFPB Director Richard Cordray. "The Bureau will continue to press to make sure that people can get the right information and the timely help they need."